I’m chilling at Starbucks Jaya One, my Café Mocha wasn’t very good and the Baristas corrected that, they made me a fresh Café Mocha and now I’m enjoying it. As I write this, I’m not running at my normal levels, I’ve caught the bug that was distressing my mum and sister, felt it creeping up on me yesterday but no way was I going to miss The Dark Knight Rises. I took some panadol and went forth to enjoy 2 hours and 44 minutes of brilliance. Last night before I went to bed, I pulled out my iPad and did some personal writing, what I’m calling Bed Time Musings, not exactly like the Holy Hour, but similar. I focus on the day itself and what I can do to make the following day better. That’s when I formulated my Hibernation Plan to fight the bug, I would sleep from 1-6am then wake up for my Holy Hour, then sleep again till noon then wake up to blog etc and then go back to sleep at about 3:30/4 and then wake up at about 7 have dinner and read for an hour, and go back to bed at 10pm. This was my plan to fight the bug, but also feel productive, that even as I was getting much needed rest, I was still being productive. (and so far the plan is on track). But anyway, after I formulated this plan during my BTMs I realised how important my Holy Hours (and now also BTM) were to me. They keep me on track, and since they became less regular, I’ve been less productive, fighting the Fibromyalgia less and sleepwalking through most of my days… Hence, my new priority is to make sure I wake up everyday at 6am, no matter what time in sleep, just for my Holy Hour, and if I need to go back to sleep after and to do my BTM every night, i already feel so much more productive after one day of this, even though I slept from 1am-6am & 7am-1130am. This morning during my Holy Hour I thought about so many things that I’ve been neglecting, so many things that I can improve on and so on, I’ve woken up again from my sleepwalk and am taking control again. 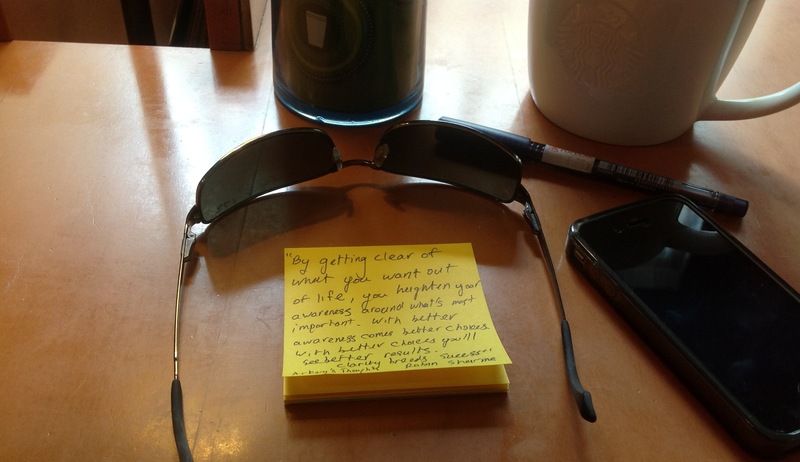 The post-it above speaks volumes. Clarity breeds success,and how to we achieve clarity? By being aware of what we want, and how do we become aware of what we want, what we need? By thinking. Too many of us are sleepwalking through our life’s, not thinking about the path we are taking, or how we can do better. We just go with the flow, just letting life act on us, instead to us acting on life. And why? Because we are unaware of the fact that we are wasting our potential, because we distract ourselves we trivial matters. It’s sort of like being stuck in The Matrix. It’s easier to just go with the flow, sometimes it painful to think about what we should be doing instead of just doing we want to do. Sometimes we just lack the discipline to keep a set time, daily to Think, (A Room of One’s Own). You don’t need to think about the complexities of life, just focus on you, focus on what you need to do to Keep Moving Forward, focus on getting Aware so that you can make the better Choices so that you can see better Results. Take control of your life. Act on life. I’ve had a lot of fun over the last 2-3 weeks but it could have also had the fun and been productive if I didn’t neglect my thinking time, my Holy Hours. In order to ensure they I don’t go back to sleepwalking, I need to be consistent with my Thinking Times. My new mission, get my body accustomed to waking up at 6am, make Holy Hours and Bed Time Musings a daily habit. Its normal to go off course in any endeavour. What’s important is to realise it and get back on track.